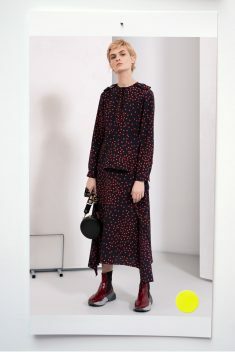 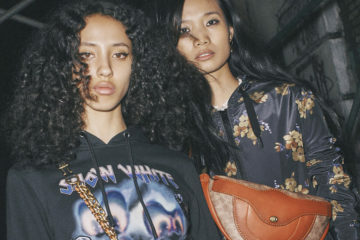 The Stella McCartney Pre-Fall 2019 collection had a connection with the designer’s personal history and worked on a series of pieces at the heart of the collection directly inspired by Yellow Submarine’s visuals. 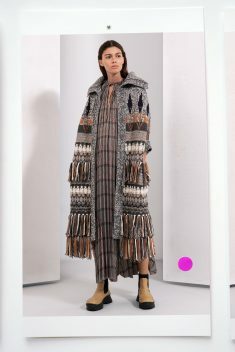 Lucy in the Sky With Diamonds pyrotechnics were rendered as colorful patchwork-printed dancers, happily shimmying on fluid silk jacquard shirts; a sensational fur-free-fur Technicolor coat boasted on the back a jacquard portrait of the Fab Four in their marching uniforms. 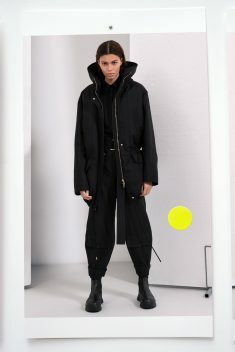 The whole collection was tinged with a personal, almost emotional feel. 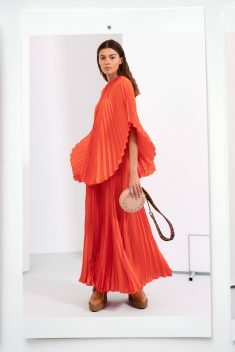 Linda McCartney’s distinctive ’70s, romantic style was referenced in long, flowing dresses in silk georgette with billowing sleeves and in a gorgeous ankle-grazing circle skirt with matching cape-shirt in flame red plissé. 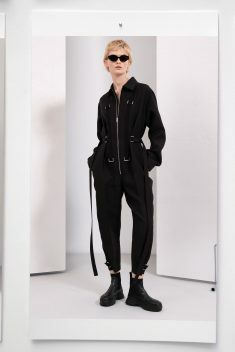 Paul McCartney’s flair for country style was celebrated in a series of quintessentially British, neatly tailored yet utilitarian coats in beautiful tweeds and Prince of Wales wools. 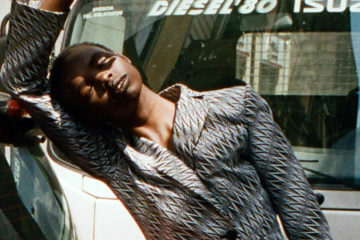 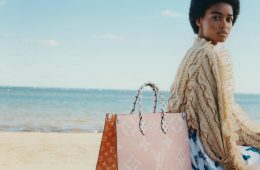 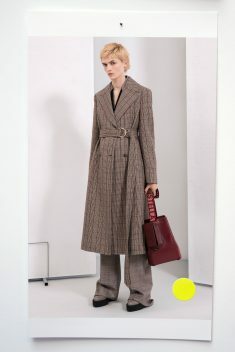 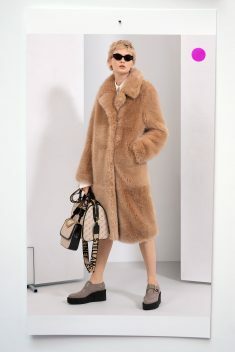 A trenchcoat in dry checked wool was double-breasted and classic at the front, while the back boasted a swinging play of pleats; it summarized the constant conversation between masculine and feminine inherent to Stella McCartney’s style vocabulary.